Heat oven to 350°F. Grease bottom and sides of 1 (13x9-inch) pan or 2 (9-inch) round cake pans with shortening; lightly flour. In large bowl, beat cake ingredients with electric mixer on low speed 30 seconds, scraping bowl constantly. Beat on medium speed 3 minutes, scraping bowl occasionally. Pour into pan(s). Bake 13x9-inch pan 45 to 50 minutes, round cake pans 35 to 40 minutes, or until toothpick inserted in center comes out clean. Cool round cakes 10 minutes before removing from pans to cooling racks. Cool completely, about 1 hour. In medium bowl, beat peanut butter and powdered sugar with spoon or electric mixer on low speed until blended. Add vanilla and 1/4 cup milk; beat until smooth and spreadable. If necessary, beat in more milk, a few drops at a time. Frost 13x9-inch cake, or fill and frost round cake layers with frosting. To make your own buttermilk, pour 2 teaspoons lemon juice or white vinegar into a liquid measuring cup and add enough milk to equal 2/3 cup. Let the mixture stand for 5 minutes before using. The flavors of buttermilk and peanut butter combine to make this a very kid-friendly cake. 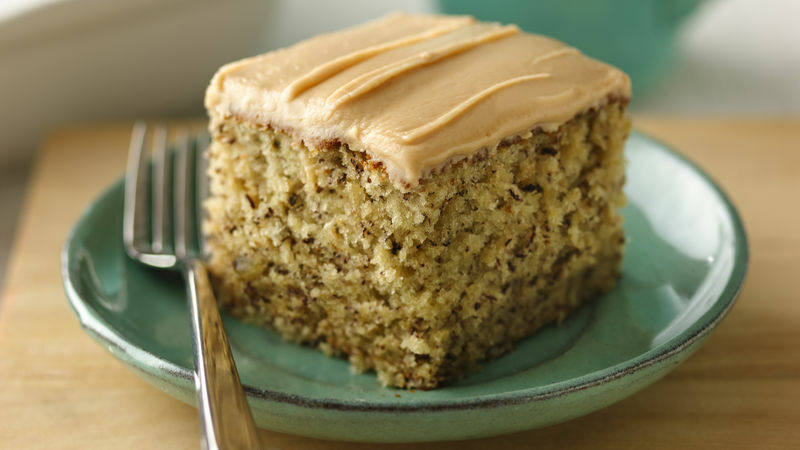 Banana and peanut butter come together in a homemade cake that feeds a crowd.